Who needs a kiss from a rose when you have Heidi Klum? 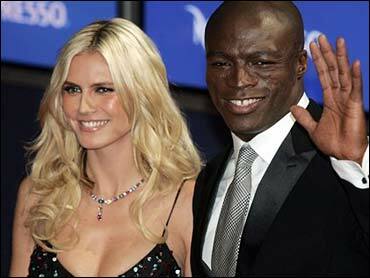 Seal and the German supermodel were married Tuesday on a beach in Mexico, Klum's representative confirmed to The Associated Press. There were no details Wednesday. In January, Klum said on her Web site that she and Seal were engaged. Two months later, the couple announced that Klum was pregnant. "There is nothing that gives us greater happiness than the realization of our dream," the statement said. Klum, 31, and Seal, 42, began dating last year, shortly after her breakup with Renault Formula One team boss Flavio Briatore, who is the father of her daughter, Leni, born last May. Klum, who is a Victoria's Secret model and has appeared in Sports Illustrated magazine's swimsuit issue, separated from her husband of five years, celebrity hairstylist Ric Pipino, in November 2002. Seal's "Love's Divine" was nominated for a Grammy Award this year. His "Kiss From a Rose" won for record and song of the year, and he also grabbed the award for best male pop vocal performance at the Grammys in 1996.